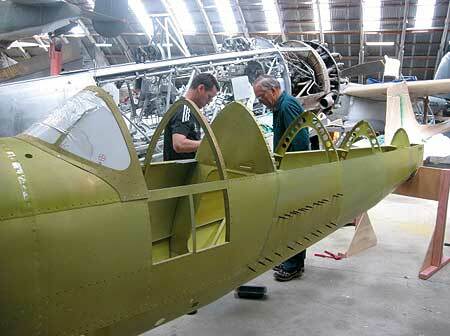 On a Monday morning Paul Bayly is building an M26 Supermarine Spitfire. 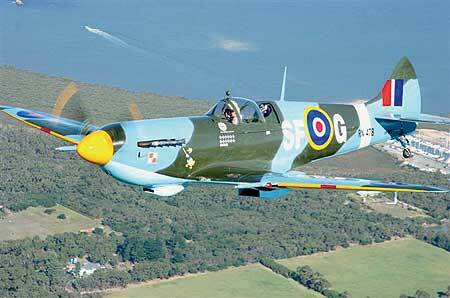 Not a full-size Spitfire, but an 80-percent-scale kitset replica of the plane that kept the Luftwaffe from seizing England’s skies in the Battle of Britain. Working at the Museum of Transport and Technology with a team of four volunteers, he is assembling aluminium components, getting ready to drop in the 380 horsepower motor that will one day get the plane travelling at more than 200 knots. “Every boy grows up, but when I saw this for sale, I thought ‘why not’,” he tells me. Paul is also involved in MOTAT as a board member who chairs the fundraising sub-committee. Bayly is a director of the merchant bank Cranleigh, which he founded in 1996 with twin brother Andy, another Massey BBS graduate. Bayly has been in the money game for more than 20 years. That’s how I discover Bayly, in addition to being a banker, is the Commander of the Auckland and Northland Regiment, overseeing two battalions of Territorials. “It could be a full-time job. My predecessor did that, more or less, but I try to work this round everything else,” he says. For a soldier he’s not physically imposing, but he’s wiry and obviously fit and he projects an air of easy efficiency as he attends to his paperwork, gets a quick update from staff on various projects, and then takes me on a tour of the headquarters, with its battle standards, photo memorabilia, and prized pieces of ancient weaponry. Bayly talks about the people who have passed before him, including another Bayly, this one a not-so-distant relative, who commanded the Auckland Company in World War I and died when a stray machine gun bullet hit him while on board the boat taking him to shore at Gallipoli. Bayly didn’t know of the connection when he joined the Regiment. But the Bayly family have been well represented in the military. His father was in the Royal New Zealand Air Force in the Solomon Islands during World War II, a grandfather was at Gallipoli and the Western Front, and his great-grandfather fought in the New Zealand Wars. “There are some families where the generations fall at the wrong time so they get called up,” he explains. Bayly joined the Regiment as part of 1985 Territorial intake immediately after graduating from Massey. “I thought, ‘where else can I get experience leading people’,” Bayly says. Bayly spent a year in the ranks – “I was hopeless, couldn’t march, real country boy, overlong steps” – before taking a commission. When he later moved to Britain he joined the Queen’s Regiment in London. “I had a wonderful time. It was real British stuff. Officer training every Tuesday night, you wouldn’t miss it. A wonderful meal, five courses, brandy, port, cigars, the whole lot. When Bayly calls himself a country boy, he is being no more than literal. The family farm was at Kai Iwi, near Wanganui, and Bayly and his brother went to Wanganui Collegiate before heading off to Massey. On graduation, rather than join an accounting firm – the choice made by every other graduate in his class – he joined New Zealand Steel. It was the middle of the Think Big era, and the steel mill was in expansion mode. “It was a fantastic operation, very exciting. I was living at Glenbrook, auditing, looking at business proposals and company acquisitions, and that crystallised my thinking. I knew I wanted to get into merchant banking. With chartered accounting and cost management accounting tickets to his name, Bayly then joined Citibank’s New Zealand branch as a management trainee. “It was great training. I did two months in the Philippines, and when I came back to New Zealand they said ‘Why don’t you set up the world corporate group?’” With one of his colleagues, he went on to do just that, targeting multinationals that had global relationships with Citibank and weaning them off the local banks they had been using. In late 1987 Bayly began postgraduate studies in economics at the prestigious London School of Economics, helped by a Portuguese flatmate who tutored him in mathematics in exchange for English lessons. At the end of the year, in the wake of the sharemarket crash, Bayly took up contract work for small merchant banks, carving out a niche in the City. Here he found being a Kiwi had its advantages. “They don’t know how to handle colonials,” he says. Humour and a healthy disregard for the establishment helped him negotiate the complexities of the British class system. Next came Africa, where Bayly took on a two-year contract to facilitate trade of plantation-based forestry products across eastern and southern Africa for the UN Development Programme and the Food and Agriculture Organisation. When his time in Africa drew to a close, Bayly had a watershed decision to make – take up a job running a timber mill in Swaziland or head Down Under to pursue a relationship with a woman he had first met at a London party before his African contract began. The heart won out, and Bayly ended up in Australia with wife-to-be Laura, working for a range of firms. 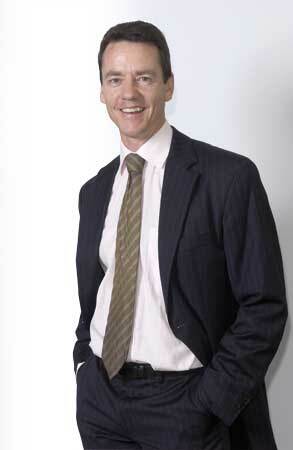 He returned to New Zealand in 1996 and immediately started some projects with twin brother Andy, who had made his own way in the financial world at KPMG, Southpac and Lloyds Merchant Bank in London. “We bought a print finishing company, invested in a waste bin business, did a luxury townhouse development in Parnell, and all the time people who knew Andy from Southpac would come for business advice. “Most of our time was spent in the print business in south Auckland. It had a big boardroom, with a double pane window looking out at the factory. understood business – after all, our own successful business was on the other side of that glass. “After some time we thought we should do it properly, so we set up our merchant banking firm and it’s grown from there to include investment banking, corporate advisory and latterly getting into asset management following the launch of our first fund to invest in clean energy technologies.” The firm has its main office in Auckland servicing clients throughout New Zealand. 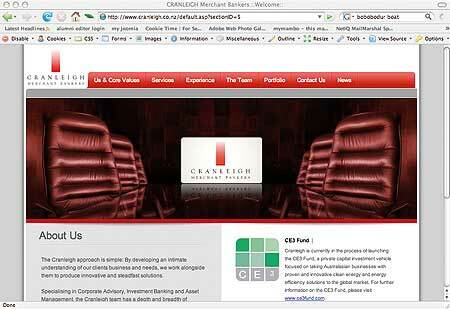 They have also recently opened an office in Sydney as they are increasingly advising on international deals. He says Cranleigh’s strength is its understanding of New Zealand conditions. Bayly says the elegant models and flow charts presented by some of the big name international consulting firms aren’t necessarily appreciated by New Zealand business. Good information, he says, is key – and good information is something many businesses lack. Bayly has also been a member of the Small Business Advisory Board since early 2007. The board, its members appointed by Cabinet, scrutinises government policy that affects small businesses. Government departments are required to consult with SBAG before they submit their policy recommendations to Cabinet. One of the organisations Bayly advises is Massey, helping his alma mater think about its business more commercially, not just managing its balance sheet but getting to grips with issues like long term financial forecasting. He would like to see more research partnerships between universities and the private sector. “There’s the potential for us to do more here. We’ve got some bloody good minds here. But it’s so fragmented and dispersed. We need a concentration of effort and a New Zealand Inc. perspective. “It was great advertising. People would come to talk about their problems, and they could see we understood business – after all, our own successful business was on the other side of that glass. A few nights into the Indian Ocean, Paul Bayly was starting to question what he was doing. 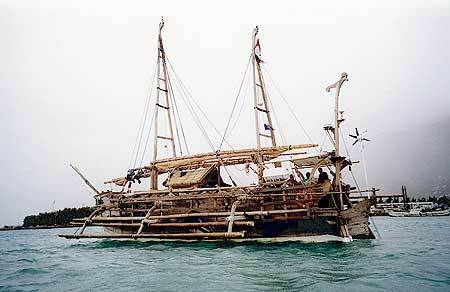 The wind had risen, and, hauled along by its massive mainsail, the Borobudur, a reconstruction of an Indonesian double hulled ship from the 7th century, wasn’t handling the conditions well. “Every so often the outrigger would catch on a wave and haul the ship over,” Bayly says. “The night watch guy said he’d seen the speed gauge showing 13 knots as we hoofed down these huge waves. Late that evening someone said they’d seen 16 knots. The highest speed over 24 hours was 22 knots. “We decided to trim the sail at night, and after that it got safer,” Bayly says. The voyage was the dream of Philip Beale, an ex Royal Navy, ex sharebroker and banker, Bayly had met during his time in the City of London. Beale had seen the design of his vessel-to-be in a carving on the Borobudur temple in central Java. “He talked for years about sailing from Indonesia to Africa,” says Bayly. If boats like the Borobudur had been used to trade with Africa, that might help explain the presence of Indonesian plants and cultural influences in Madagascar and mainland Africa. Bayly was brought in to do logistics and safety. “I had done a lot of amphibious ops with the Commandos so I knew about things water and safety issues. The Borobudur left Jakarta on August 15, 2004, arrived in the Seychelles in late September before heading south to Madagascar and on to Capetown, arriving there the following January. The voyage finally finished at Accra in Ghana. 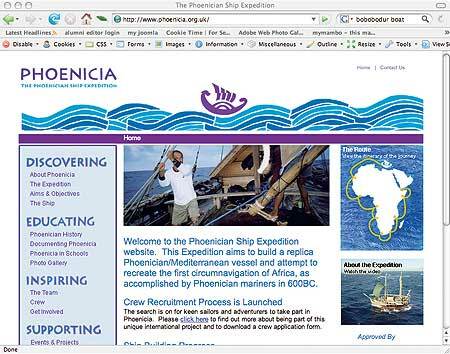 Beale now wants to recreate the circumnavigation of Africa by a Phoenician trireme in 600 BC. The ship is being built on an island off Syria. “It’s due to launch in June 08, and the difference this time is we will have rowing as well. I can’t wait,” Bayly says. “I’m going to beat the drum or something. This article was first published in Issue 24 of the Alumni & Friends magazine, April 2008. See related links below for more articles from this issue.